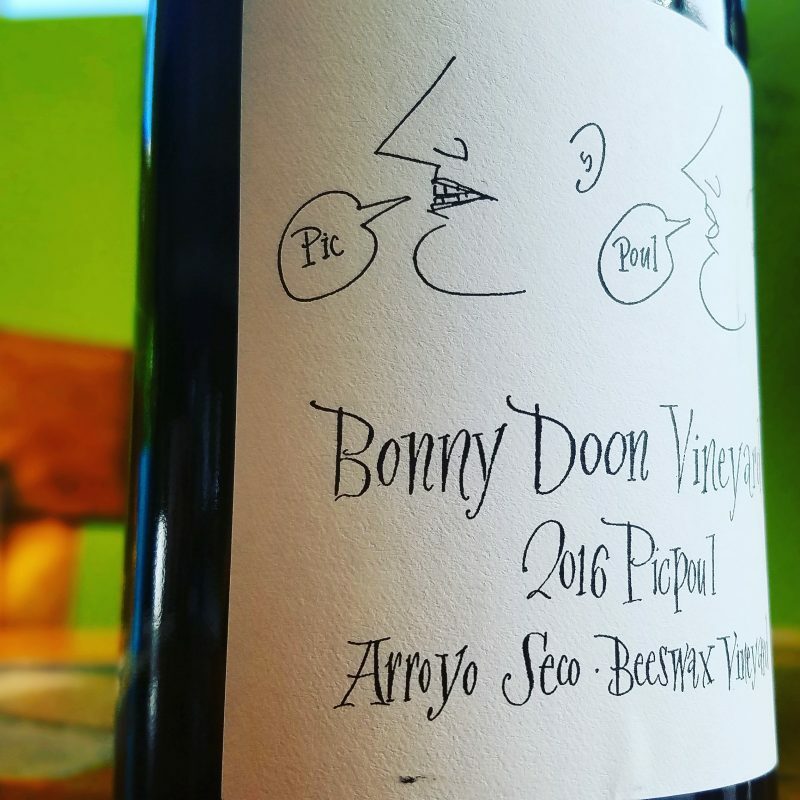 While on the Central Coast we made the pilgrimage to Bonny Doon Vineyard’s tasting room on the Pacific Coast Highway in Davenport, CA. We left with a couple bottles of their 2016 Picpoul. The grapes for this 100% Picpoul Wine come from Beeswax Vineyard in Arroyo Seco. So this grape is from the Southern Rhone and often is used as a blending grape. The label by Wendy Cook steers you toward the meaning of the name. “Pique-poule” means lip stinger in French (or pecking hens depending on your translation, either way…you can picture the hens pecking your lips) It’s one of those 13 varieties of grape that are allowed in Châteauneuf-du-Pape. Picpoul does come in red (Picpoul Noir), white (Picpoul Blanc) and pink (Picpoul Gris), but the white variety is most prevalent, which is why Bonny Doon refers to their Picpoul Blanc as simply Picpoul. In France it is best known today as Picpoul de Pinet from the Pinet Region of Languedoc. Arroyo Seco is an AVA in Monterey County. The AVA covers two towns, Soledad and Greenfield. The area sits in the Salinas Valley 40 miles from Monterey Bay, which brings dense fog and howling winds during the growing season in the Eastern and Central Portions of the AVA. Named for the “Arroyo Seco” a seasonal waterway that brings in water from the Santa Lucia Mountains and the Los Padres National Forest. The Western portion of the AVA runs east to west in a narrow gorge that is sheltered from the Monterey Bay fog and winds and has higher daytime temperatures. The AVA covers over 18,000 acres and is one of the smallest AVAs in California and has about 7,000 planted acres. 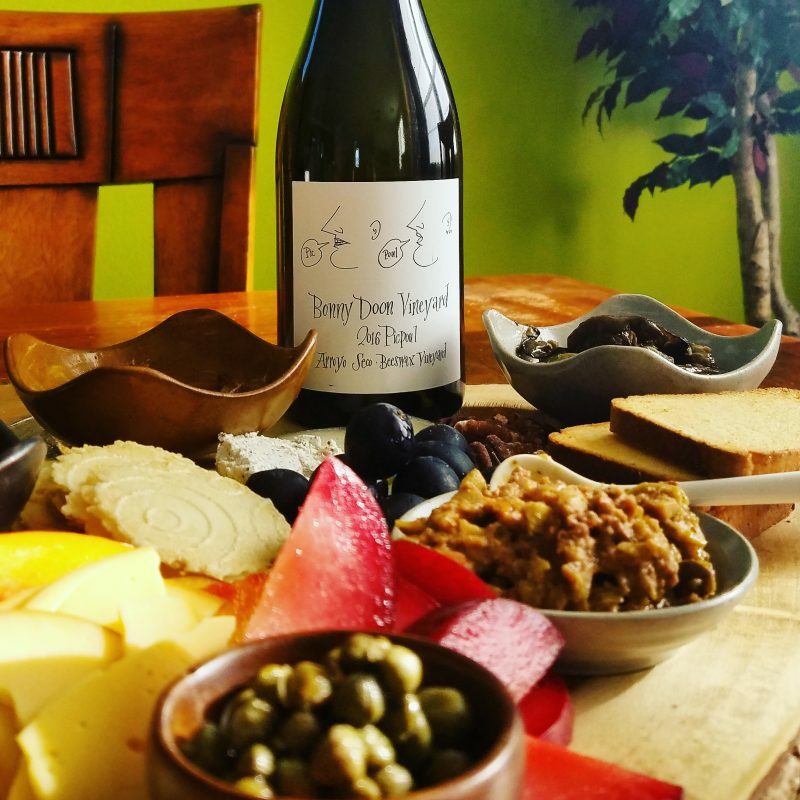 Beeswax Vineyard is owned by the Silva family who also runs Poppy Wines. It was established in 2000 and has 24 acres of organically farmed wine grapes with blocks of Pinot Noir, Grenache Blanc, Roussanne and Picpoul Blanc. This tiny vineyard is in the Salinas Valley toward the southern end of the AVA and is nestled into the Santa Lucia foothills. This wine was mouthwatering and bright, with a light straw yellow color. You get minerals, ocean and a floral note when you stick your nose in the glass and then tart green apple and stone fruit pits in your mouth. There is in the background this little bit of beeswax. It is a lovely and subtle wine. What to Pair with it? I spent a little time in the afternoon researching what to pair with this wine. I started with the Bonny Doon site, which gave me “the briniest oysters you can find or Dungeness crab.” Well, sadly, finding either of those for the evening dinner was not really a possibility, so I searched further. Tablas Creek Vineyards also does a Picpoul (there are not many wineries in the country that do), and they suggested; Fried Calamari, Thai dishes with lemongrass and ginger, Dover sole, Cerviche, Braised tuna or Swordfish. Well, that I could work with and Calamari and some Thai lemongrass sticks were added to the shopping list. Okay…so now we had a list to work with. We headed to TJ’s, to see what we could find that might fit the bill and give us a wide variety of things to try. So we ended up with a big platter with a variety of things to try with this wine. We included; smoked oysters, herbed goat cheese, anchovies, smoked gouda, sardines, olive tapenade, capers and a couple Spanish Cheeses; Manchego and Iberico . We later dinned on the Calamari with a mayo, greek yogurt dip with thyme, lemon juice and lemon zest and the Thai Lemongrass chicken sticks. As I tasted an allegory took hold in my mind, so indulge me as it carries me through my tasting notes. Smoked oysters are not my favorite thing, but paired with the Picpoul they mellow and created a lighter tone for both the oyster and the wines and pulling up a floral note in the wine. This couple I really didn’t think would get along and they ended up having a great conversation. This is a fine pairing (remember when your date told you that you looked “fine”). The Spanish cheese pulls out the body in the wine and the saltiness in the cheese. These two might date for a while. Anchovies are a little loud and unruly in your mouth. A sip of the Picpoul mellows and soothes the flavor and makes those anchovies much more likeable. These two change when they are together and continue changing in my mouth, like a couple lovingly pushing each other to take another step. They meet and compliment each other. The compliments make them smile and their smile makes each more beautiful. This is a blending that just makes you happy. Neither the Spanish cheese or the wine stand out, but together they are just right, snuggling in my mouth like an adorable quiet couple. The picpoul just flatters the capers here, brightening them, while toning the acid in both and giving a little floral note to the bite. I think Picpoul might get Capers number. Alright these two are the life of the party. Each are good but together they are a party in my mouth and are tearing up the dance floor! I’m out of allegory here. This was a great pairing, and while I think it would have been good with just Calamari and Picpoul the addition of the dip with the greek yogurt, thyme and lemon zest really kicked it up a notch. This was good. Mellow not a stand out, but certainly a good meld. Maybe my allegory wasn’t so far off. Hopefully, this will inspire you in a couple of ways. To search out some Picpoul to start with and then to try some pairings. Take a moment with a wine and a food and think about them. What do you taste, what does it make you think of. Taste and explore! Then come back and share with us! Our first 100% picpoul was at Tablas Vineyard several years ago — what a revelation! Love this article and will be trying ALL your suggestions! My first Picpoul was at Tablas Creek also! I am so in love with Rhones and need to find a way to get to some Rhone Ranger events this next year! I didn’t realize they were doing any picpoul in Arroyo Grande. There is so little of this in CA but now I’ll to seek this out. I’m a huge fan of the grape, and a mono varietal wine is rare and gorgeous in deed!